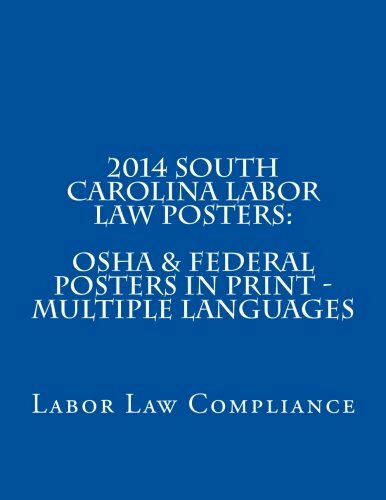 2014 South Carolina Labor Law Posters: OSHA & Federal Posters In Print - Multiple Languages To receive a complete set of printable 2014 South Dakota Labor Law Posters: OSHA & Federal Posters on CD, send $59.98 ($49.99 plus $9.99 S & H) to turnaroundmedia212@gmail.com at PayPal.com. Please include name, address, email and phone number. Allow 7 – 10 days for your CD to arrive. Also Available: To receive a complete set of printable 2014 Federal Labor Law Posters on CD, send $59.98 ($49.99 plus $9.99 S & H) to turnaroundmedia212@gmail.com at PayPal.com. Please include name, address, email and phone number. Allow 7 – 10 days for your CD to arrive. Contact us at turnaroundmedia212@gmail.com for other States on CD.